The organization is separate from and not related to the Saint Louis Area Dressage Society. The St. Louis Area Dressage Society Education and Scholarship Program recognized by the IRS as a 501c3 organization as of November 11, 2013. The executive board of the St. Louis Area Dressage Society Education and Scholarship Program is by bylaws of the EASP governed by the Executive Board of SLADS and will have a scholarship committee for the SLADS –EASP organization. Benefits of the SLADS- EASP include the ability of the EASP to accept tax deductible donations that are in the interest of the EASP for the purpose of scholarship and promotion of the education of dressage in the St. Louis area. 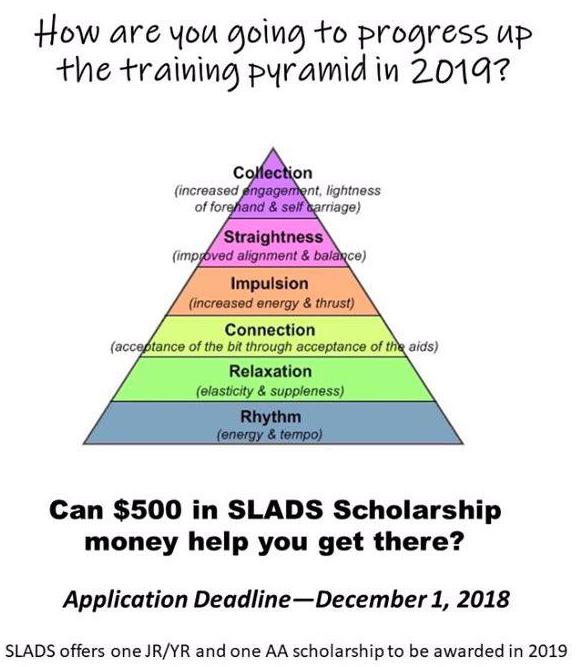 Organization is in its infancy but the SLADS board is looking forward to the opening of more educational and scholarship opportunities with the acceptance of the 501c3 application. 1. Is this new for SLADS? This needs–based scholarship was established in 2010 to assist one committed SLADS Junior /Young Rider with the financial burden associated with furthering their dressage education. One SLADS Junior/Young Rider will be awarded this scholarship in the amount of $500 on an annual basis with the first payment in the amount of $250 presented at the Annual SLADS Awards Banquet and the remaining $250 in June of each year after the written report on how the first payment has been utilized is received by SLADS. 2. What is a Junior/Young Rider? Per USEF rule GR126, it is an individual who has not reached their 21st birthday as of December 1st of the current competition year. 3. What does “current SLADS member” mean? All applicants MUST be SLADS members the year the application is submitted as well as the year the Scholarship is awarded. Example: An applicant must be a member of SLADS when applying for the scholarship. That means they are a SLADS member on or before 30 June 2012. This same applicant must be a member of SLADS for the year 2012 before the SLADS Awards Banquet Is held in late January 2013. 4. When are the applications due? All entries must be post-marked on or before December 1 of each year. A committee comprised of one SLADS Board Member and two to four people with distinguished dressage backgrounds will then review the applications. The judges may or may not be members of SLADS. The Committee will review the applications and give consideration to those who have proven a serious level of commitment to the discipline of Dressage. The applications that meet the criteria will be presented to the Board off Directors for a vote on the final recipient. 5. How can this Scholarship be utilized? This needs-based scholarship may be used for training, attending clinics and seminars. It is to be used to support the recipient’s dressage education. If they wish, it can be used to help with showing expenses for both recognized and schooling shows. It may NOT be used to purchase tack, clothing, pay for veterinarian costs, etc. As stated, it is to be used to support and further the applicant’s dressage education and goals. 6. What is required of the applicant who receives the scholarship? The scholarship money is used as stated in Paragraph 5. It must be used education or to help with showing costs (i.e., fees). The applicant, through a written communication, will submit two reports to the SLADS Board on how the money is spent. One report will be due on 30 June. The other report will be due on 30 November. The first half of the scholarship will be released at the January Awards Banquet. The second half of the money will NOT be released until the first report is received by the SLADS Board of Directors. 7. What steps can I take to present an outstanding application? Sit down with your trainer and discuss how you can utilize this scholarship and set a plan. Make sure the application you are submitting is complete and all documents are included. Make three (3) complete copies for the Committee to review. Make sure the applications are received by the due date of December 1st. Include a description of how you have volunteered for SLADS in the past as well as your strategy on how you have will perform your SLADS Volunteer duties in the upcoming year. 8. It cannot be emphasized enough…make sure that your application is complete with all required documents attached. Yes. This talent/dedication as well as financial needs–based scholarship is being established in 2013 for the 2016 and subsequent competition years to assist one committed SLADS Adult Amateur Rider (AA) with the financial burden associated with furthering their dressage education. 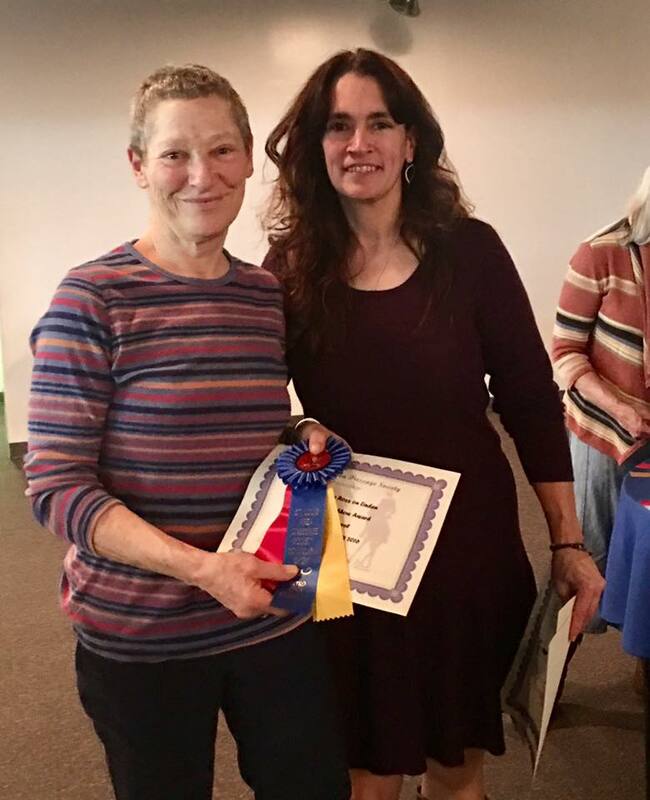 Annually, one SLADS AA Rider will be awarded this scholarship in the amount of $500 with the first payment in the amount of $250 presented at the Annual SLADS Awards Banquet and the remaining $250 in June of each year after the written report on how the first payment has been utilized is received by SLADS. 2. What is an Adult Amateur Rider? GR1306 Professional/Amateur Status 1. Amateur. Regardless of one’s equestrian skills and/or accomplishments, a person is an amateur if after his 18th birthday, as defined in GR101, he has not engaged in any of the activities identified in paragraph 4 below. a) In the Dressage Division, individuals are only eligible to compete as amateurs from the beginning of the calendar year in which they reach age 22, see DR119.3. Accepts remuneration AND rides, exercises, drives, shows, trains, assists in training, schools or conducts clinics or seminars. Accepts remuneration AND gives riding or driving lessons, showmanship lessons, equitation lessons, trains horses, or provides consultation services in riding, driving, showmanship, equitation, or training of horses. Accepts remuneration AND acts as an employee in a position such as a groom, farrier, bookkeeper, veterinarian or barn manager AND instructs, rides, drives, shows, trains or schools horses that are owned, boarded or trained by his employer, any member of his employer’s family, or a business in which his employer has an ownership interest. Accepts remuneration AND uses his name, photograph or other form of personal association as a horseperson in connection with any advertisement or product/ service for sale, including but not limited to apparel, equipment or property. Accepts prize money unless permitted in Rule GR1306 paragraph 3d or 3e. Rides, drives or shows any horse that a cohabitant or family member or a co-habitant or family member’s business receives remuneration for boarding, training, riding, driving or showing. A cohabitant or family member of a trainer may not absolve themselves of this rule by entering into a lease or any other agreement for a horse owned by a client of the trainer. Gives instruction to any person or rides, drives, or shows any horse, for which activity his cohabitant or another person in his family or business in which his cohabitant or a family member controls will receive remuneration for the activity. A cohabitant or family member of a trainer may not absolve themselves of this rule by entering into a lease or any other agreement for a horse owned by a client of the trainer. not owned by him, his cohabitant, or a member of his family, a farm/ranch / syndicate / partnership / corporation / business in which he, his cohabitant or a member of his family controls. Advertises one’s equestrian services such as training or instruction. Accepts remuneration AND acts as an intern, apprentice, or working student whose responsibilities include, but are not limited to, riding, driving, showmanship, handling, showing, training or assisting in training, giving lessons/coaching and/or schooling horses other than horses actually owned by him. Accepts remuneration in excess of rental fee for use of a facility, ring or school horses. Accepts remuneration for such use AND uses commercial logoed items while on competition grounds unless expressly permitted by applicable division rules. All applicants MUST be SLADS members the year the application is submitted as well as the year the Scholarship is awarded. Example: An applicant must be a member of SLADS when applying for the scholarship. That means they are a SLADS member on or before 30 June 2013. This same applicant must be a member of SLADS for the year 2013 before the SLADS Awards Banquet is held in late January 2016. All entries must be post-marked on or before December 1 of each year. A committee comprised of one SLADS Board Member and two to four people with distinguished dressage backgrounds will then review the applications. The judges may or may not be members of SLADS. The Committee will review the applications and give consideration to those who have proven a serious level of commitment to the discipline of Dressage. The applications that meet the criteria will be presented to the Board of Directors for a vote on the final recipient. This scholarship may be used for training, attending clinics and seminars. It is to be used to support the recipient’s dressage education. If they wish, it can be used to help with showing expenses for both recognized and schooling shows. It may NOT be used to purchase tack, clothing, pay for veterinarian costs, etc. As stated, it is to be used to support and further the applicant’s dressage education and goals. The scholarship money is used as stated in Paragraph 5. It must be used to further rider education or to help with showing costs (i.e., fees). Make sure you show a financial need and demonstrated commitment to furthering your dressage education in your application. Include a description of how you have volunteered for SLADS in the past as well as your strategy on how you will perform your SLADS Volunteer duties in the upcoming year.